What's an ALT? | Borderlink, Inc.
ALTs are Assistant Language Teachers that work in public elementary, junior high, and senior high schools across Japan. ALTs come from a wide variety of backgrounds, some with teaching experience, and others just looking to make a difference in the lives of students. While some Japanese language skill is recommended, it is not required. Japanese elementary schools have grades 1 to 6, and the students are aged 6 to 12 years old. ALTs are placed in elementary schools to allow students to become comfortable working with foreigners, and ALTs are placed in schools to encourage students to communicate as much as possible in English. Games, songs, and collaborative activities become the platform for the use of English. ALTs play with the students on the school grounds, interact with them in their clubs, and at lunch. If you enjoy working with young children, this is the place for you! Some ALTs prefer to work with older students. Junior and senior high school ALTs teach students aged 12 to 18. As the students are tested on their English skills, there is a greater emphasis on reading and writing, in addition to speaking and listening. Therefore the role of the ALT is to foster communication between students by creating interactive and fun skits and other activities. In many schools there are English elective classes or after-school English clubs for students who want to take their English skills to the next level. Also, in junior and senior high schools, after-school clubs and sports are high priority for the students. ALTs are encouraged to join in, and so many find themsel ves playing such sports as soccer, softball, or basketball with the students. If you are not good at sports, don’t worry. There are also non- athletic clubs including the archery club, the brass band club and even the art club. The large majority of ALTs teach at both junior high school and elementary school. This combination allows them to draw connections between elementary and junior high English instruction, as well as provide the ALT with a broad teaching experience. Please find a general outline of what an ALT's day is like at a junior high school. When you get to school, you change your shoes at the front entrance and make your way to the staff room. The staff room will be your home base, as it is for all of the teachers. Students in Japanese junior high schools stay in the same classroom the entire day, and you will go to their classroom when you are scheduled to teach English there. When you arrive at the school in the morning,you will be touched by the enthusiasm of the students as they greet you with a shy smile, a wave, or calls of good morning and hello. 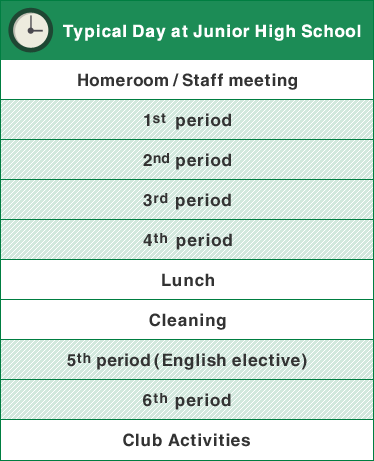 Everyone's schedule is different, but you will teach up to 6 periods a day, working alongside the Japanese teachers. The students eat lunch in their classroom, and afterwards clean the rooms and the hallways. After the students are finished with their classes, they have club activities. You can join in on a game of basketball, or watch the kendo students practice. The dedication and the comradery of the students will amaze you. At the end of the day, you speak with the Japanese teachers of English about the the next English lessons you will have at that school and prepare teaching materials such as flash cards or work sheets. With a smile and a wave, you bid farewell to the staff and those students still practicing with their clubs. Everyday as an ALT holds surprises and memorable experiences. It is a job that will change your view of the world, a job that you will carry with you forever.